If you follow any fitness accounts on YouTube or Instagram, chances are you've seen some pretty impressive box jumps, with athletes landing atop stacks of boxes towering over 50-inches high. 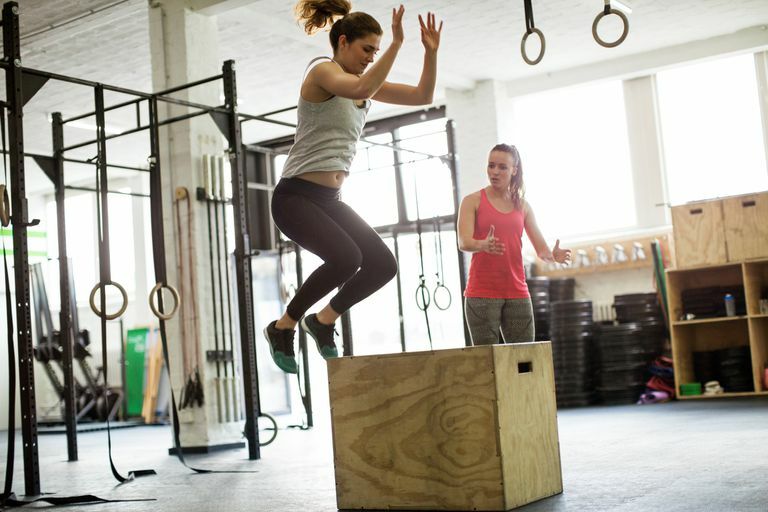 It's the type of feat meant to impress and inspire other exercisers to action, but it's important to note that box jumps are a more advanced exercise that should be undertaken with some caution. That said, after you develop a good baseline of leg strength and practice more beginner-friendly jumping exercises, you should feel comfortable practicing box jumps with a low step or box. Box jumps are an excellent way to enhance explosive power, further develop strength through your lower body, improve vertical jump height, and generally improve athletic performance. The key is to start with a low box to get accustomed to the movement—select something between 12- to 24-inches in height, depending on your personal level of confidence and strength. The exercise itself, in theory, is simple. The whole goal is to simply stand facing the box, then in a smooth motion, jump from the floor to the top of the box, landing both feet at the same time. That's it. But, as with most things, the devil is in the details. It's important to master proper form as you learn the exercise, even if the short jump feels simple because it will enable you to perform the exercise safely and effectively as you progress in box jump-height. Box jumps require significant engagement of the lower body and core, as well as coordination and concentration to perform the exercise correctly. Generally speaking, box jumps are a good exercise to include in strength- or power-focused workouts, and they should be incorporated toward the beginning of the routine, after a solid warm up. This ensures the muscles they target won't be excessively fatigued, making the exercise safer to perform. Box jumps target all of the muscle groups of your lower body, including your glutes, hamstrings, quadriceps, and calves, working together to enhance power and strength. Beyond the lower body, though, box jumps also require strong engagement of the core and a swinging motion of the arms, turning them into a full-body exercise. One of the greatest benefits of box jumps is their ready application to enhanced sports performance. Athletes from just about any sport or activity (basketball, football, and volleyball are just a few examples) can see improved athletic performance with proper application of box jumps to a workout routine. If you can become stronger, faster, and more powerful through training in the gym, you can apply those gains on the court or field. And even if you're not a competitive athlete, enhancing your power and strength with box jumps can generally help you move more powerfully through life. You can hop up onto curbs, play a pick-up game of basketball with your kids, or leap up from a chair if the occasion calls for it. Finally, box jumps give you the opportunity to work on vertical jump height without the level of impact of some plyometric exercises. Think about it: When doing a box jump, you're working on explosively jumping as high as you can, but your feet land on an elevated surface, with your knees and hips already slightly bent—a position that helps reduce the impact to your bones and joints. This is quite different from a vertical leap from the floor, or a tuck jump into the air, where you're jumping as high as you can, but then your feet land back where they started. These types of jumping exercises place much more stress on the joints, and if landing form isn't correct, could leave more room for injury. All you need to perform box jumps is a commercially available plyo box, a sturdy bench, a chair, or another sturdy elevated surface. If you're just starting out, get comfortable with a lower box or surface before trying to advance to taller boxes. Also, make sure the box you choose won't slide around or be inclined to fall over if you kick it. The goal is to land directly on top of the box, so theoretically, most sturdy chairs or benches should work, but you don't want to catch the edge of a chair with your foot and have the whole thing fall over as you try to land on top of it. Stand facing the box, your feet within roughly six inches of its side. Your feet should be about hip-distance apart, your knees and hips slightly bent in an athletic stance. Bend your knees and press your hips back as you swing your arms behind you in a smooth motion. Explode through the balls of your feet, jumping straight up into the air, swinging your arms up and forward as you fully extend your knees and hips to get as much height as you can with your jump. At the height of your jump, bend your knees and hips to draw them forward to be able to land on top of the box. Land with both feet at the same time atop the box, leading with the balls of your feet, following with your heels. Try to do this "softly," allowing your knees and hips to bend naturally to help absorb the shock of the landing. Check your foot position—when on top of the box, your feet should be roughly hip-distance apart. Step—don't jump—carefully off the box and reset for the next repetition. Because box jumps require total-body engagement in an explosive movement, there's a lot of ways that things can "go wrong." Even though the concept is simple and straightforward—theoretically you've been jumping in some capacity since you were a kid—the only way to progress efficiently is to make sure you're performing the exercise correctly. Starting with a box that's too high is one of the most common mistakes. For starters, it's a good way to lose your confidence if you can't perform the exercise. You're also more likely to kick or trip on the box, fall over, or scrape up your shins. If you've never done the exercise, start with a short platform—just 12- to 24-inches—to get comfortable and make sure you're using proper form. You can always level up to the next box height if you find the jumps are too easy. And remember, the box is a tool, not a badge of honor. The intention is to work on the explosive power and vertical height of your jump—something you can do whether you're using a 12-inch box or a 48-inch box. It's fairly common practice to see people jumping off the box to reset or rebound for their next repetition. But it's important to understand that jumping off a raised surface, while it may seem easier than jumping up onto a raised surface, actually places a lot of stress on your joints, and if you're not careful, it's when injuries are most likely to occur. Even if you've done a lot of plyometric training and feel comfortable doing "depth jumps" (jumping off a raised surface), it's still a good idea to exercise caution and step off the box carefully, rather than jump off. This is especially true for beginners and for those progressing to higher jumps, but really applies to everyone. Landing the box jump correctly is the key to preventing injuries, particularly of the knee. Common mistakes are landing with one foot prior to the other, landing with your feet together, or experiencing knee valgus (a "caving in" of the knees toward each other) as you land. Perform the exercise in front of a mirror or have a friend watch you to check for unwanted knee movement. A common culprit for this problem is weak glutes and hips. If you can't seem to correct the issue after a few attempts, hold off on doing plyometric exercises like box jumps and work on developing greater lower-body strength with exercises like squats, glute bridges, and banded lateral steps. To catch poor foot placement, look down when you land. Your feet should be roughly hip-distance apart, just as they were when you left the ground. Two of the primary goals of box jumps are to enhance explosive power and vertical jumping height. But to achieve these two goals effectively, you need to experience full hip extension as you jump, leaping up into the air as high as you can before bending your hips and drawing your knees forward to execute the landing. A common mistake people make is skipping the vertical leap with full hip extension, cutting the exercise short by "hopping" from point A to point B, just gaining enough air to pull the knees forward in time to land. Try doing the exercise in front of a mirror to see if you're experiencing full hip extension as you jump. Box jumps require fresh legs to be the most effective. If you save box jumps for the end of your workout, you're going to be tired and you're not going to be able to perform them to the best of your ability. And as such, you're not going to see the type of improvement over time that you'd like to see. Go ahead and pencil in box jumps for the beginning of your workout, after your warmup. Keep repetitions fairly low—just two or three sets of three to five reps is plenty, especially if you're focusing on form and optimum performance. If you're not quite ready to hop on a box, try step ups instead. While the exercise won't develop explosive power or vertical jump height the way a box jump does, it will target the same muscle groups on each side of your body. Try adding a slight hop at the top of each step up to develop a little of the power that translates more effectively to a full box jump. It's easy to make box jumps more challenging—simply grab a taller box! As you develop greater power, hip mobility, vertical jump height, and strength, you can keep upping the ante by graduating to the next level of box. Most importantly, you should have a good baseline of lower-body strength before attempting box jumps. Only incorporate box jumps after consistently following a well-rounded strength-training program for a few months. Before you get started, spend a few weeks adding lower-key plyometrics, like jumping rope or skipping drills to your warm-up. These exercises will help your muscles grow accustomed to higher-impact, power-generating movements before you attempt box jumps. And, as stated previously, start with a low box. It's a safer option for newbies and it reduces the likelihood that you'll experience any number of potential injuries, from falls to shin scrapes to ACL tears. For well-conditioned athletes, box jumps are a generally safe option, but if you have lower-extremity injuries or back pain, hold off on trying them until the issue resolves. Also, pregnant women should consult a doctor before attempting box jumps. If you're pregnant and have been exercising consistently and performing box jumps regularly, your doctor may give you the green light to continue early in your pregnancy, but will probably tell you to back off as your pregnancy progresses. If you're pregnant and haven't been exercising or performing box jumps, this is an exercise that should probably be avoided until after your baby arrives and your body has had some time to recuperate.